What is Rollston trying to get across, using what evidence, and reasoning from it how? The main point of Rollston’s article is that the nation of Israel, early in its history, believed in several gods, One of which was Yahweh. As time progressed, this belief system morphed into a belief that Yahweh was head of a pantheon of gods; and then finally that He was the One, true God. These primary nations, Ammon, Moab, and Edom held similar belief systems of a “divine council,” or assembly of gods. Both epigraphic and biblical evidence supports the idea that all three nations had a chief, or national god, during the time period in discussion. These national gods were part of the greater assembly of gods. It is believed the above scripture was an earlier form of this text. In it, the head of the Pantheon and is assigning different nations to the care of other, lesser gods. Yahweh was “assigned” the nation of Israel. Yahweh, it appears was Israel’s “national” god for some time, while operating within the construct of a divine assembly. Multiple excavation sites in Israel have unearthed religious inscriptions referring to “Yahweh and Asherah.” Asherah was a believed female goddess and venerated in the surrounding areas. Along with the discovery of abundant numbers of female idols from archaeological projects in Israel (pg. 109,) we also have scriptural evidence of Israelite Asherah worship in 1st Kings chapters 14 and 16 for example. What differences emerge between the “world in the text” (the biblical narratives) and the “world behind the text” (the actual history that produces the biblical narratives)? The biblical narratives have been found by scholars to contain many “pseudo-corrections.” These are alterations made to the original texts by the scribes as they were copying them. These “corrections” were motivated by religious objections held by those responsible for the preservation of the stories. Most changes to the stories and oral traditions were made as the nation moved from a polytheistic belief system to a monotheistic one. One correction, noted above, was the change of Deuteronomy 32:8-9 (page 105). As the cult belief system moved from polytheist to monotheist, the language and sometimes whole stories regarding the prophets were changed to reflect a more Deuteronomistic view. As well, narratives regarding the reforming kings, namely Josiah and Hezekiah, were changed to later take on the theme of monotheism as a core value. Many times, actions taken as military or political strategies were presented as theological reforms by the revisionists (Lectures.). In many ways, these “good” kings were portrayed as being first and foremost concerned with the worship of the One true God, when in reality, one could argue they were more interested in protecting themselves from the encroaching hostile nations surrounding them. How might a religious community of your own experience respond to Rollston’s piece…or to the discovery that the piece’s claims are not even slightly controversial in the field of biblical studies? On first read, I believe most in my faith community would be shocked, if not horrified to read this article. The idea that the chosen ones of Israel would have, at any time, worshiped anyone except Yahweh would be unthinkable. We are very much ingrained with the idea, “You shall have no other gods before me,” leads us to assume that the Israelites were monotheistic from the very beginning. I was returning home this morning from taking my kids to school, and I was flooded by memories of my grandmother. That was kind of surprising, but I stopped my car in the driveway and just let the memories flow. I have to admit, I don’t think of her that often. She passed away 15 years ago, a lifetime considering how far I have traveled down life’s path in that period. But, as I sat there, the biggest smile came to my face and heart as I remembered specific encounters with her. She was not a television caricature of a grandmotherly figure. She wasn’t a sweet, little old lady making cookies every afternoon. However, she did make a chocolate cake to die for. Instead, my grandmother had a hard edge to her. No doubt, she was a result of her upbringing during the Depression and such. I knew she loved me fiercely, but not in a warm and fuzzy kind of way. She took bluntness to an almost offensive level. She never sugar-coated anything. She always spoke the truth (as she saw it,) and never seemed to take your feelings in account when doing so. (Memories of “He’s just not that into you…” are flooding through my mind.). She wasn’t malicious, just honest. She was the hardest worker I have ever met in my life. She was always working. If not at her job, then in her garden, her kitchen, anywhere she was, needed something done. She rose at 5:30 each morning, cooked breakfast and set off to work. And she didn’t stop until late that evening. She occupied herself with caring for my brother and me. I just realized this morning what a stabilizing presence she was for us in what, many times, was and unstable childhood. I spent every weekend with her from the age of ??? until I was 15. Weekends filled with favorite foods, favorite tv shows, and anything else I wanted. I remember distinctly going to the dime store for banana icees and lollipops bigger than your head. She took me to see my first movie, Snow White, when I was around 6. She read me the same book before bed for years, because it was the one I wanted. Living in a small town, all our high school ball games were broadcast on the radio. So even when she couldn’t make it to a basketball game, I knew she had sat by her radio listening, because later, she would discuss what the announcers had to say about my performance. She probably didn’t understand everything she heard, but her heart was there. She sure didn’t mind sharing her opinions about the people I dated. And she was wide open on stressing the dangers of drugs, alcohol, cigarettes, wild parties and the backseats of cars! Nothing was off limits for her. But here was the greatest things about her: she loved me, no matter what. She had this unconditional love that was steadfast, never-wavering, and always looking out for my best interest. I am convinced that she would have loved me the same whether in her living room or visiting me in prison. I won’t say she always believed the best about me, her honesty made sure of that. She never thought I was perfect, however, regardless of where I was in life, she loved me anyway. What a perfect model for understanding my Savior. I can understand His love for me, because I have experienced it with her. I believe in His unchanging love and ever-flowing grace because I have experienced it with her. And, like my grandmother, Jesus is self-sacrificing, always looking out for my best interest. He is my safe harbor in the midst of the storm and the place that I run to when in need someone to love me unconditionally. Just like her. I hope that you have someone in your life that represents that kind of love. If you do, maybe spend some time remembering today. Or even better, if they are still with us, call them up and say thank you. God places those “channels of grace” in our lives to bless us. May we be forever thankful for them. Thank you for my grandmother. Thank you for reminding me of her today, and showing me how very much I was loved as a child. What some wonderful memories. Help me to love with the same steadfastness as she did. And lead me to be a grace dispenser to those most important in my world. So, according to Jesus, this is the key to life. The greatest commandment. But what does it mean? How can I love God with everything I have? As a good friend reiterated to me a couple of days ago, “You can’t give an “A” effort to everything.” And she is right. So how does my devotion to God work with family, work, school, and all the other things that are important in life? I don’t have all the answers, but I do think I took a step closer to understanding this week. First of all, I work for a church. I have the great privilege of working with a whole group of holy people, of which I am the very, very least. But their influence is good on me. So you would think I would be on top of things spiritually, but to tell the truth, I am not. So we decided we would be faithful and do the study together. It is on the Gospel of John. Things started off wonderfully. We sat down after dinner Sunday night, opened our Bibles, and one by one, began to read chapter 1. It was amazing! 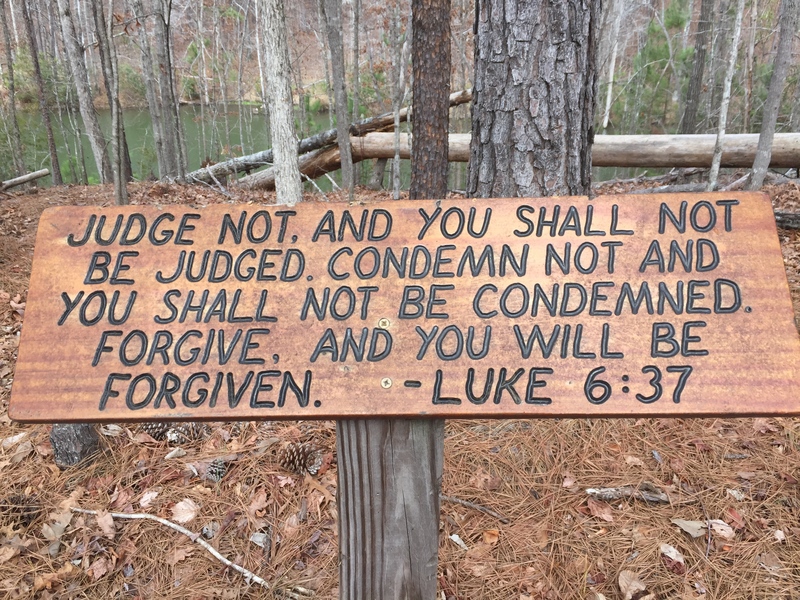 I can’t tell you how wonderful it was to sit there, for over an hour, with my children and listening to their thoughts about these sacred words. I was inspired by their depth of knowledge (Thank you Sunday School Teachers!) and their eagerness to be there. I was so thankful that we were doing this together. Surely this was something that would be easy to continue for the remainder of Lent, for we all enjoyed it so. This would be great! Then Monday happened. We got up, rushed to work and school, ran home, started laundry, started dinner, started homework…. And as we were cleaning up for dinner, the thought occurred to me, “We all feel terrible, it’s late, we will just skip tonight and catch up tomorrow.” The truth was, allergies and some other issues had hit us hard that day, and we did all feel pretty much like doing nothing. Plainly put, I was just weary and in a bad mood. It wouldn’t hurt to miss a night. We will catch up. However, my ailing children had other ideas. We were going to do that Bible study, sniffles, sneezes, coughs and everything else! I am ashamed to say that I tried to talk them out of it; reasoning that we all needed our rest. They would have none of it. So out the Bibles came. We read, prayed and discussed. And it was wonderful. It renewed my soul. I had fun with my kids, again listening to what their thoughts were. We held hands and prayed. We not only prayed for our own needs, but some of those we knew of in the community. It was the best thing I had done in a long time. And I don’t know if the kids enjoyed it so much because we were doing something together, or if they were just that excited to read the Bible. But either way, their enthusiasm was contagious. I was thankful they had insisted. Because, with just a little resistance, I was more than willing to let that opportunity pass us by. Thank you for continuing to strengthen and encourage my family. Our hearts are willing, but our minds are weak. Forgive me, for putting all other things first. Have mercy on me, and continue to lead me into faithfulness, especially when it isn’t easy. Thank you, for your work in my children’s lives. Help me to live as a better example and teacher for them. One of my most favorite activities is a Monday morning contemplative prayer group that meets at our church. It is a time of deep reflection and conversation with God. I was there this morning and had such an experience that I just had to share it with my brothers and sisters. A great beginning of conviction, confession and repentance for the season. I left our prayer chapel and begin walking into the back yard of our church. I had a special place in mind to go and contemplate the vastness of Christ’s grace. Almost skipping along, I was praising my Jesus because, as the good Christian I am, I always try to do the right thing. I would NEVER intentionally sin (right???) But my Savior, Jesus, he has my back. Even when I, UNKNOWINGLY, make a mistake He is right there to forgive and forget. So all is good and I can go merrily on my way. I serve a great God. Well that is a bucket of cold water on my good mood! At first I wanted to protest. I don’t judge people. I am a grace-filled Christian that loves everybody. All my friends tell me so! But, in my heart, I know that is not true. In my heart, as I stood there, listening to what my Lord had to say to me, I knew that He was speaking truth. I am doing my best, yes, but I still have so far to go if I am to be the person He wants me to be. He calls me to be a grace dispenser in the world; to show every person the love He has for them. I fear I may never get there. But I trust in that vast grace to catch me when I fail. These types conversations with Jesus are not easy, and they are rarely pleasant. But friends, they are so necessary. I want to walk with Jesus. I want to have a real relationship with Him. But that means getting past the superficial conversations that help me to pretend I’m OK. That means listening when He tries to point me in the right direction, and not protesting that I am already there. It means letting go of my pride, and clinging to grace offered me by His divine perfection. By protesting my innocence, I live a lie. But I am only lying to myself, because He already knows my heart and my attitudes. The road to true humility is a hard one friends. Your grace is incomprehensible. I like to think of it as a warm, fuzzy blanket. But today, in your righteousness, it is more a cold shower of reality. Speak to my heart, Lord. And keep speaking until it is changed. Cloak me in humility, so that I might listen instead of reject you. I praise You. For You are the God of second chances. Thank you for never giving up on me. This statement by Walter Houston has really challenged my way of thinking about the Old Testament prophets. My opinion of the prophets has always been based upon my limited engagement with reading them. I can’t say they have ever been my favorite writers in the Bible. However, after reading the books of Hosea, Isaiah, Jeremiah and the rest, I have always thought their main objective was to convince the Israelites to stop worshiping foreign idols. Of course, if you have read one prophet, you have read them all, right?? “Stop worshiping Baal, turn back to Yahweh, or you will be destroyed by and invading army.” I guess that is why my current study of the Book of Amos has been so enlightening. I have learned a number of things, not only about Amos, but about the other prophetic books as well. Before we get started, make no mistake friends, these are not my own ideas. As I share some of the things I have learned, I will share where these ideas came from. I think that is important lest some of you think that I have become a Bible scholar ! Actually, I am taking a class on the Old Testament, and the majority of what I share comes from either my lectures, or my text book, The Hebrew Bible, by Christopher Stanley. First of all, when we speak of prophets, we normally think of people that predict the future, right? Wrong! (most of the time.). Prophets in the ancient world could more correctly be described as intermediaries (Stanley.). These folks were people who had a special connection to God, and were believed to be messengers for Him. From time to time, acting in this messenger capacity, the prophets would speak about things to come, but only in the sense that “these things will be the eventual outcome of your behavior.”(lecture.) Much like when your mom says, “Stop touching the stove. You are going to get burned!” We get a good sense of this whenever we see the words, “Thus says the Lord!” Whenever we see these words, the prophet is acting as a messenger for God and is reminding us of what God wants us to hear. So listen up. Along with speaking truth to authorities, many times the prophets were called to a form of internal criticism, meaning they would speak or confront their peers or societal contemporaries (lectures. )We see this function appear in the Book of Amos. The Book of Amos contends with an 8th century BC prophet from Judah – although his messages were aimed at the northern kingdom of Israel. He was not a “professional” as he did not belong to any of the prophetic guilds (lectures.) By trade, it appears Amos was somewhat wealthy, and indicated to own livestock and possibly vineyards or gardens. The occasion for his prophetic statements was undergirded by a rising disparity in the economic classes of Israel. What exactly does Amos believe is wrong with Israel? The message for the Israelites is clear. If they do not turn from their greedy and dishonest treatment of others, they will lose the very things they value. Is there any hope for these people? Is there anything they can do to remedy their past actions? Amos does give them some hope. In 5:14-15, we see the prophet show them a way out. “Seek good and not evil…establish justice in the gate…it may be that God will be gracious to you…” It doesn’t sound much like he believes that will happen, however, as a prophet, I suppose he sees his job as an instrument to herald God’s redemption as well as conviction. From a literary standpoint, Amos uses many traditional conventions of the ancient prophets to make his point. Along with acting as a messenger, we also see the elements of lamentation and the sharing of visions from God (lectures.) Amos pulls out all the stops to get his point across. However, in the end, he makes clear that God will follow through on his promises of destruction for the disobedient people, he speaks in chapter nine of the coming exile for his people. However, fortunately our God is a faithful God, remembers his covenant with David, and promises to make good on it in the time to come.